I use Gimp to create graphic art/cartoon prints. I have been running into a problem where the colors of some backgrounds or portions of images are automatically adjusted when I print. Specifically, the problem occurs when I have two prints that need to match. The HTML color codes are the same between images in both the Gimp file and the saved .jpg/.png files but when images are printed, the color comes out much lighter on one print than the other. The problem is persistent whether I use my home Epson printer or have the prints printed commercially. The attached images show a cartoon wiener dog; half of the dog is printed as one image and the other half is printed as a second image. The front half consistently prints much lighter than the back. Different versions of this picture have varying degrees of automatic color adjustment depending on the colors of the dog's sweater. The color appears fine (and as I said, the html color codes continue to match)until the image is printed. How can I turn off this automatic adjustment? 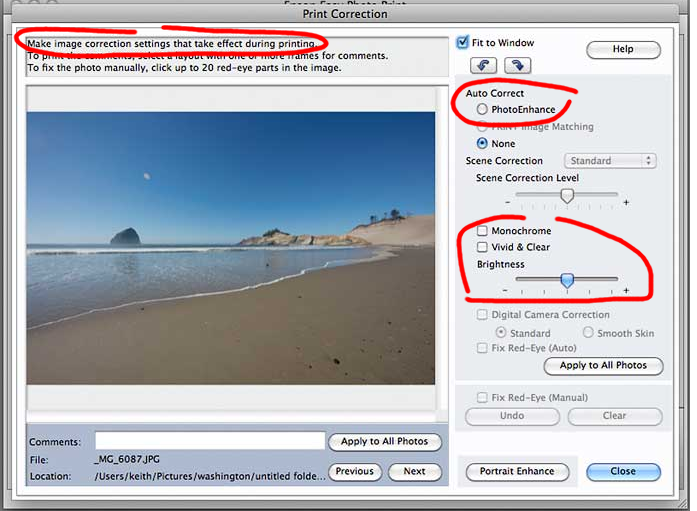 Probably not Gimp, more likely to be your printer settings, some sort of auto level for brightness. The front has about 35% less white in the image than the back, so the printer software might be compensating by making the print lighter. See if there are any settings in the printer set-up that might look like this. screenshot http://i.imgur.com/nFSTXn0.png if you have anything auto-correct enabled try turning it off.